Jake Gyllenhall stars in "Prince of Persia: The Sands of Time." 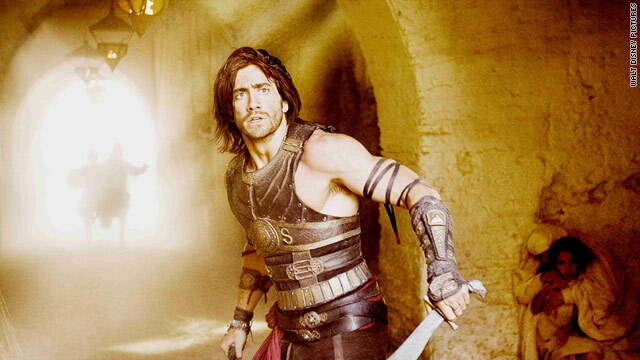 Jake Gyllenhaal stars in the Jerry Bruckheimer-produced "Prince of Persia"
When will movie makers learn that video games aren't good film foundation? (CNN) -- Hollywood remains bewitched with the synergistic potential of the big-screen VG adaptation -- yes, even after "Alone in the Dark." But just as there is nothing more boring than watching someone else playing with their joystick, there has yet to be a satisfying movie derived from this source. Gaming aesthetics have altered the way that movies look -- action films anyway. But when Hollywood tries to capitalize on video game storylines, the results have mostly been grim. That's not surprising. After all, a video game isn't structured towards propelling a linear plot. On the contrary, a good game is about opening up multiple possibilities and choices for the player or at least a series of challenges that the gamer can master over time. Perhaps films will one day take on that interactivity. But not yet, and attempts to build stories on this narrative quicksand are likely doomed to fail. None of this deterred producer Jerry Bruckheimer, the man who realized the possibilities in a theme park ride ("Pirates of the Caribbean"), but it has foxed his four credited screenwriters as well as the veteran English director Mike Newell. Back in the 1990s, Newell was putting his hand to expert comedies such as "Four Weddings and a Funeral" and even the underrated underworld drama "Donnie Brasco." Nowadays, in his 60s, he's helming big-budget, special effects blockbusters and making a hash of it, too. With its full surfeit of Arabian bazaar bric-a-brac -- ostrich races, sandstorms and harems -- "Prince of Persia" is a gruelingly energetic and vacuous piece of pseudo-myth mongering, set in ancient Persia. Jake Gyllenhaal, he of the sorrowful eyes and recumbent features, is the half-Prince Dastan, plucked from the gutter as a child by the wise king Sharaman (Ronald Pickup), who sees some incipient nobility in this street urchin's destiny. With biceps like barbells and beach bum hair, Gyllenhaal doesn't look very Persian, but he's certainly got the English accent right. Presumably this is to complement his co-stars: former Bond babe Gemma Arterton as the petulant princess Tamina, who reluctantly accompanies him on his quest; Alfred Molina, designated comic relief as an entrepreneur of dubious repute; and Sir Ben Kingsley as the king's shifty brother, Nizam. These characters would look one-dimensional in a Disney cartoon, but the actors' frequent costume changes can't disguise their textureless personalities. Gyllenhaal (or his stand-in) is properly athletic in the regularly spaced but typically incoherent action scenes, running up, over and around walls and performing more backflips than your state senator. But he seems half-asleep whenever he's forced to listen to Tamina, which is often. Poor Arterton is stuck with the worst of the dialogue, the kind of instructional prompts you would get from Sonic the Hedgehog between levels: "Now we're heading into the Valley of the Slaves -- but that's suicide!" That may be a very nifty device in a video game, but it's next to useless in a movie.